Open your meeting with a bang! We’ve got dozens of shows that will energize, entertain and motivate your audience to set the perfect tone for your meeting and create a memorable experience. We’ll customize the content and length of the performance, even incorporate your product, logo or theme. We can also make your executives a part of the show. Let us know what you have in mind and we’ll make it happen. 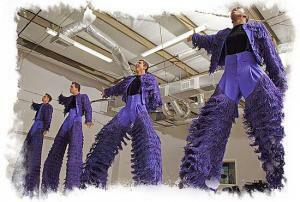 The 2nd Story Guys is a variety and dance act that performs on stilts. The 2nd Story Guys work many hours creating the latest and most exciting choreography and tricks for the act. They appeared as one of the top 20 contestants on the second season of the NBC reality television show America’s Got Talent. Regardless of the venue, The 2nd Story Guys will always give you the performance of a lifetime! 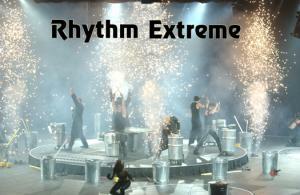 Rhythm Extreme is a percussion/dance show that delivers an intricately orchestrated, vigorously choreographed show in the style of such well known shows as “Stomp”, “Tap Dogs”, and “Blue Man Group”. Whether it’s a full length show or a short customized segment for a corporate event, Rhythm Extreme’s performances are just plain fun: crashed, banged, tapped, kicked and slammed into your subconscious! Rhythm Extreme has been so successful because virtually every show is different, and clients love to see their own products or business environment turned into a rhythmic extravaganza. Rock is the FASTEST PAINTER IN THE WORLD !! Paint dances mid air to fire exploding as Performance Artist Rock Demarco transforms blank canvas into incredible works of art. Looking for an exciting unique way to kick off your next company party? Succeed in drawing visitors attention to your trade show booth! Rock can even custom create the show to work perfectly with any theme. Let Rock launch new products, convey messages or pump up your crowd. Don’t let your C.E.O just walk onto the stage during an opening session. Rock can immortalize him with a huge painted image which opens the way for the King of All Magic to produces your chief from behind a wall of smoke and fire! ZeRo TaiKo prowls the edge of fusion music, reshaping it into a unique, multi-sensory experience. ZeRo uses Taiko, the ancient art of Japanese Drumming, as a springboard into creativity by merging the percussive Ki (spiritual force0 with the modern wizardry of synthesized sounds, ethnic instruments, and powerful visual performance. The result is a dynamic contemporary world beat ensemble, which draws background, into the soaring rhythm and vision of their performance. Vibration and harmony, sound and vision, these are the catalysts which leap from ZeRo TaiKo to the listener, spirit to spirit, transforming the ordinary into extraordinary musical experience.